There is private parking on the premises as well as extra spots on 3rd South. 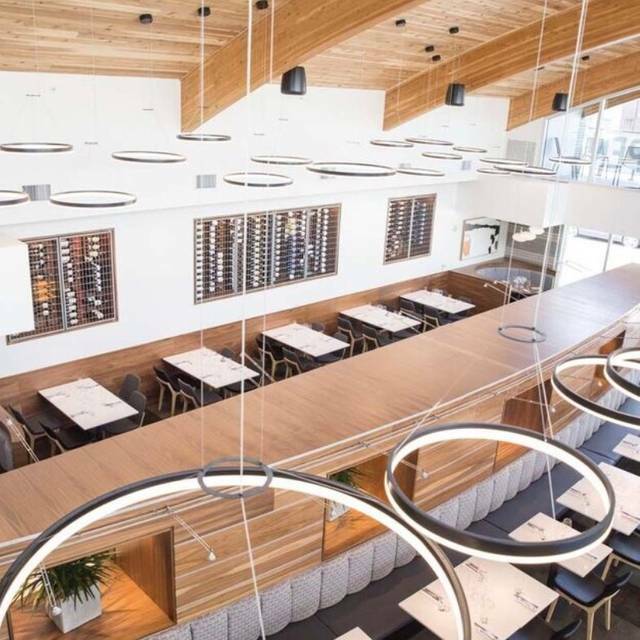 Stanza Italian Bistro & Wine Bar is Salt Lake’s newest addition to the downtown dining scene. 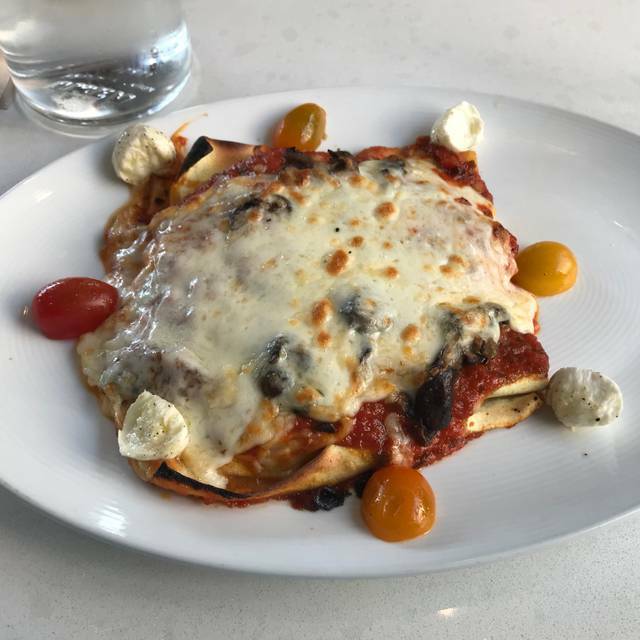 Executive Chef Jonathan LeBlanc has created an amazing menu with tastes of Italy and a contemporary take on a traditional cuisine. Beverage Manager, Raya Wall is on hand to guide guests through our wine list showcasing the wonderful variety from all over Italy. Desserts, such as house-made gelato and sorbet and seasonal cannolis, are created by our talented Pastry Chef, Amber Billingsley. Located a few minutes walk from the heart of downtown, we are perfect for dining before shows and concerts and even U of U football games. And, with private dining space we can host private parties of 10-100. Please come and enjoy the gifts of good food and good wine with your family and friends. Lunch; the waiter thought my order of a ceasar salad with chicken meant chicken sandwich with a side caesar. After that was straightened out by a longer term waiter, everything was ok. Stanza might rate higher with me for dinner as would most restaurants, but lunch food all over SLC is just ok. I suppose it's what you get when your bill is about $15.00 I will go again to Stanza. I went with my husband and daughter, and while the service was good, none of us liked our entrees. The descriptions of the entrees and what the food actually tasted like were very different for all three of us. It's not a budget option, but the food, service, and decor were all exquisite. The ribeye was the most flavorful I've had anywhere. It's fully carpeted, so not nearly as noisy as most places. I'm all in favor of returning when we want great Italian and we find ourselves flush with cash. 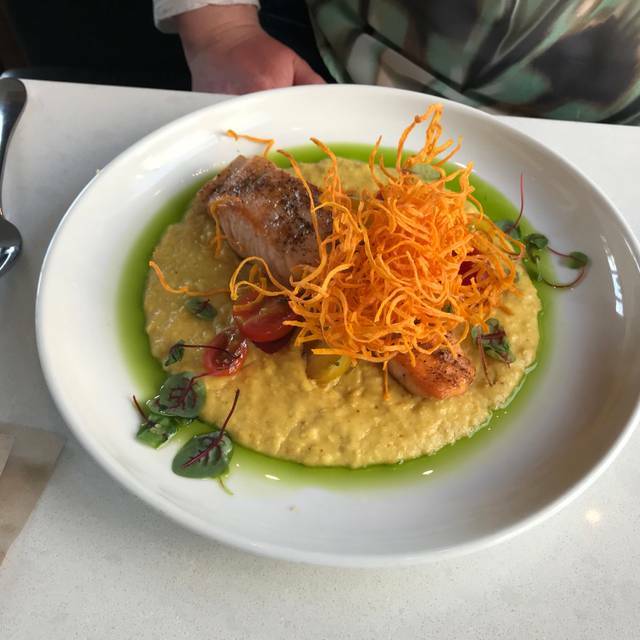 We were completely blown away by the professionalism and charm of the waitstaff (Andrew in particular) and the excellence of the food and it’s presentation. Not sure why we’ve never been here before, but now that we discovered this Gem we will return often. The ambiance of the restaurant was modern chic, but warm and inviting. I love the ambience, but when I go out to dinner the food is the most important part. Pretty disappointed, I will not recommend this restaurant to my friends. 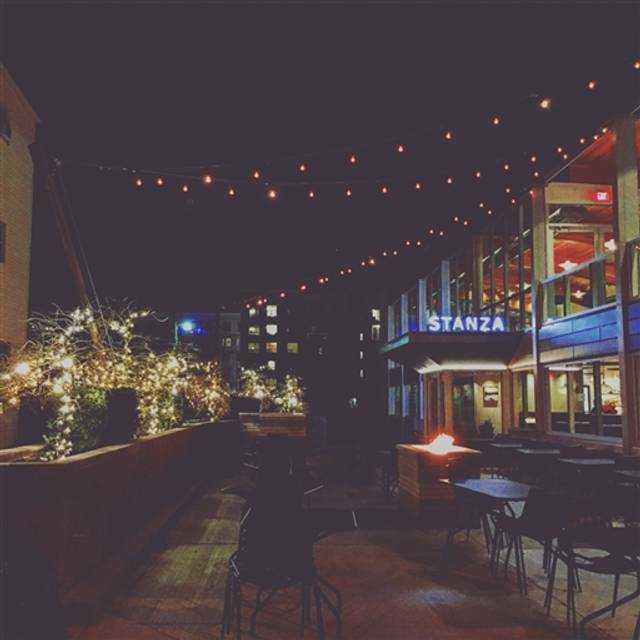 It was our first visit to Stanza Italian Bistro, and we did enjoy it immensely !! We will go back there again with our frinds next time. Great food, service and ambiance. We would recommend a visit. Great service, nice ambiance, quiet enough to have a conversation, and the food and wine were very good. Stanza was much nicer than I first expected. Our server was Madison, and she was incredibly nice and quick. I will definitely recommend Stanza to friends and family. Food was delicious- they even filled a special request for my vegetarian husband! Thank you Stanza and crew! Great restaurant! Friendly service, nice atmosphere! Wonderful food! Excellent service, and delicious food! The staff was kind and quick. Every dish ordered was perfectly made. I'll definitely be going again. The food was horrible. We ordered the Fritto Misto and there were co calamari only the bread crumbs. We also ordered the bake clams with mussels, what a joke baby clams and bay mussels that obviously were frozen. There I ordered the linguini with lobster and shrimp, the lobster was soft, of course I didn’t eat it. Anybody know lobster is hard. Horrible experience will never go there again and will never recommend and they called themselves an Italian restaurant, obviously their chef has never been to Italy or has had any seafood. Asqueroso!!! Already have recommended a few friends to go. Stanza is pretty amazing. We loved the atmosphere and the service. A tenured was training a newer waiter this night as I had taken my girlfriend and her two daughters for a night out. The ambiance, service, and amazing food made our night. We will be back. Next time, we'll bring our supper club with us. That good!!! 5 stars!!! So much fun, great food, fantastic, wonderful , professional staff and management ! Thank you Michael , Elizabeth for another wonderful, memorable, fantastic evening with friends ! 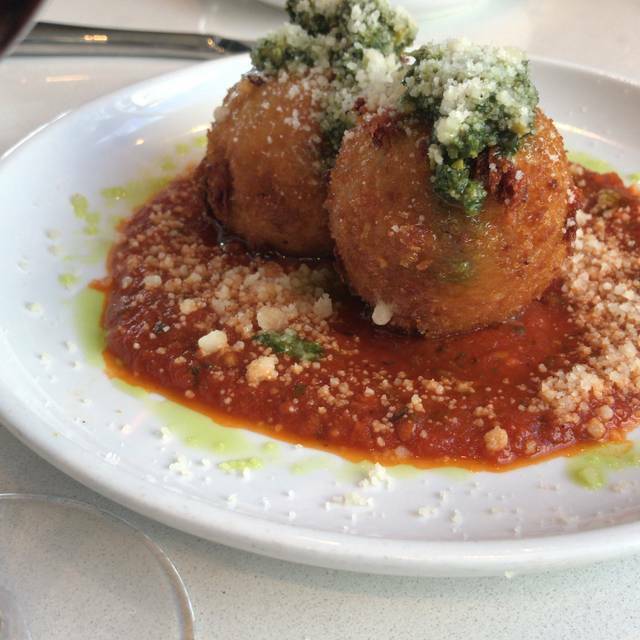 Arrancini are a great starter. The pasta dishes are quite large. 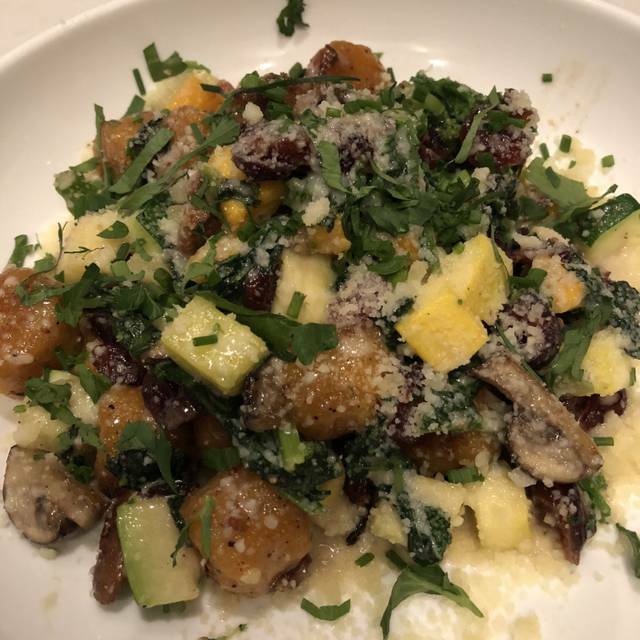 The ricotta gnocchi with goat cheese was excellent. Food tasted amazing and service was very good and quick. A bit expensive though. Would love to see a few more vegan options on the menu. Food has always been good! One of the most delicious meals I’ve had in a few years, including trips to Paris, NYC, and Oaxaca Mexico. The place is a touch loud and is a bit cavernous for my taste, but I like the overall style of the place. Service is friendly and quite casual. Unfortunately, we were still fairly disappointed in the service. The food was better, but we expected more. Our server was lack-luster (and didn't know the difference between vermouth and other amaro), the busser threw away our left-overs, and the manager was non-responsive to questions. Waitress gave amazing recommendations. Will definitely be going back. The meal was amazing, and Zachary gave us some fantastic service. We started with the antipasto, which was decent, but I don't know that I would get it again. I got the market fish, which was Mediterranean Sea Bass, which was delicious. Both of us loved it, and it was actually fairly priced for being market fish. Definitely worth going just for this. My husband got the duck, which was good, though not my favorite. The duck itself was good, I just was not a fan of it paired with the blackberry sauce. I do, however, know of others that love the dish, and we came here at their recommendation of that dish. My husband also does not like wine, but Zachary recommended a wine that he actually thought was pretty good. We ended the meal with their dark chocolate panna cottage and the gelato sampler. The ?lemon? Pine nut gelato was like a zap of electricity to the tongue, with a similar flavor to key lime pie. The chocolate panna cotta was very delicious, though I wish there had been more raspberries, or a lite raspberry drizzle. A big thing for both of us is service, which was impeccable. Zachary checked in often enough that we felt we were paid attention to and welcomed, without being pushy or imposing. We were very happy with the experience, and plan on coming again in the future. Very affordable for a high end restaurant. Usually at nice places we spend about $200 (with tip), and we spent only $150 (also with tip). We had a reservation for 7:30 and had to wait 25 minutes. We were told we could wait at the bar or in the lounge area which would have been fine but it took the bartender about 10 minutes to even acknowledge us. When we were finally seated it took our server a while to come over. The food was good but didn't compensate for lousy service. Would not go back and would no recommend. I did mention all of this to the manager before we left in hopes that they will improve because it has potential. It feels like an average restaurant trying to be a fancy expensive restaurant. The food is good but not worth the prices they charge for them. The parking is terrible and they have no valet so we had to park two blocks away. The lighting is bright in the dining area so it seems less intimate and just kind of odd. Overall, a decent restaurant with some good food, but doesn’t quite reach the level of others in that price range. The ambiance is very nice and we enjoyed our visit. The food was good as well. We liked what we ordered and would likely return. 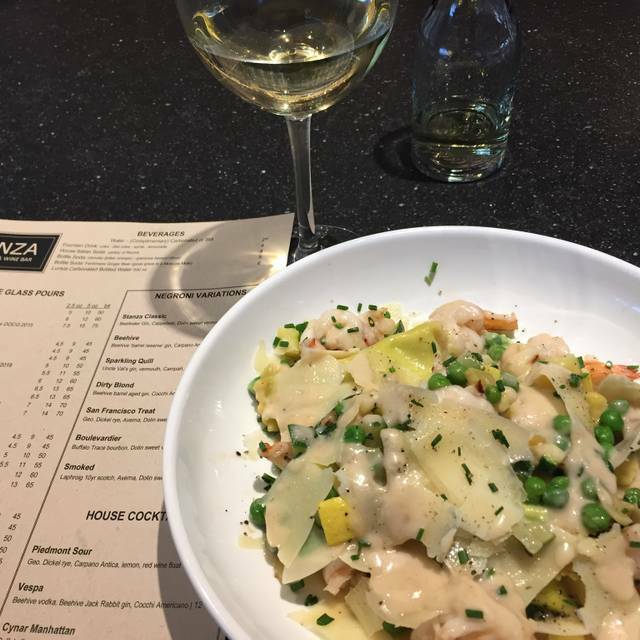 We love the food & service at Stanza. 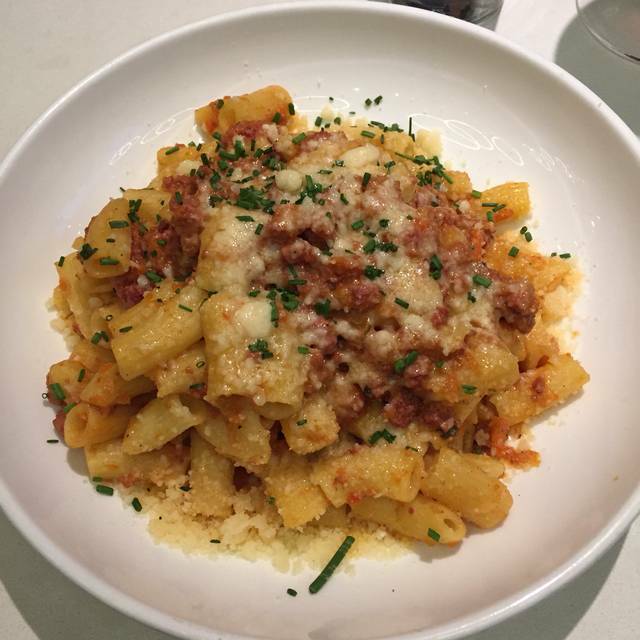 The pastas are made in-house, the quality and food presentation are top line. The Valentine's Day menu sets the mood for an important celebration. Amazing 5-course fixed menu (choice between 4-5 different dishes per course) for Valentines Day. Waitress was incredible as were the bartenders and other staff we interacted with. Thanks for making the night very special! Excellent food and service. Valentines Day perfected! We chose Stanz for Valentine’s Day because they’ve never let us down. This visit exceeded our expectations with their five course fixed priced menu. The only complaint is that there was too much food offered. One course featured a stuffed sausage in a flavorful sauce. While every dish was great, this one was exceptionally seasoned. I wanted to lick the plate and end the meal with that dish, it was so good. The service is always great and their manager is always a great host. Great menu usually but do NOT ever come here on valentines day or any time they have a different menu from the regular one. The food was terrible. I was expecting the same high quality food I have had before but it was the opposite. It should have been better food than normal for such a special day. The food was all cold & didn't even taste good! It tasted like it was pre-made & heated up. Not worth it at all for the price of $65 per head. Waste of money & time. I wont be coming here again. The 5-course Valentine menu was extraordinary. It was difficult to choose because all offerings were enticing. The service was professional, attentive and well timed. We will definitely return. Great location for our group of 6 on Valentine’s Day. The service was on point and food was incredible. We thoroughly enjoyed the venue and we will be back. 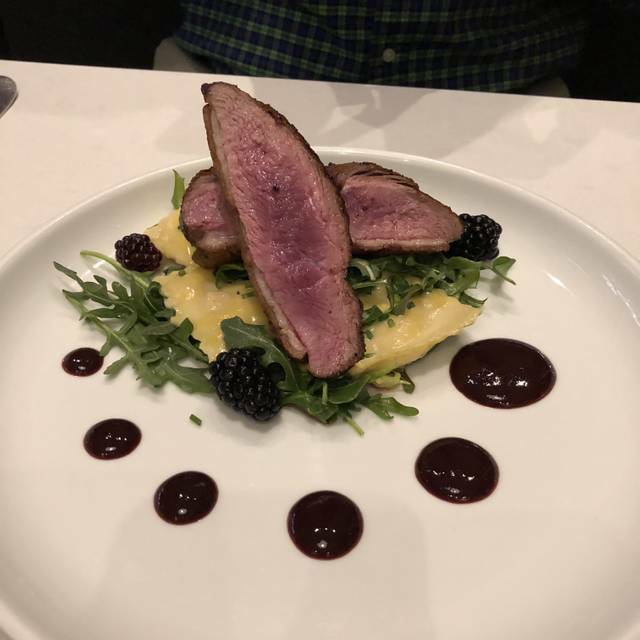 The duck breast was delicious, especially the blackberry reduction. I would have liked to see a few more wine options but the wine was very good that I ordered. I sat at the bar and when it got busy the server couldn't really keep up with the restaurant drink orders and also his bar customers but it wasn't awful. All of the staff was very kind and polite. The interior design and lighting is another reason why I keep returning. We have never had a waitress ask us what time we needed to be out to make it to our special event. That was so courteous. The timing of service was just right, the atmosphere is wonderful, and the food was delicious and seasonal. Great, memorable experience. We tried many different dishes amongst our table on Saturday night, and everything was absolutely delicious! Service was fantastic, and the dishes are original and flavorful - everything from the appetizers through to desserts.